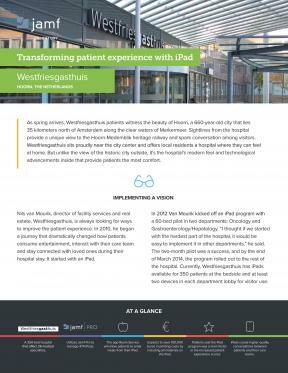 Always working to improve the patient experience, Westfriesgasthuis offers patients iPads at the bedside. Paired with BeagleBoxx, a mobile service company, and Jamf Pro, Westfriesgasthuis gives patients the ability to access TV, music, games, news and more - all from the iPad. Since the implementation, Westfriesgasthuis has seen notable improvements to their patient appreciation scores, and staff are happier than ever.